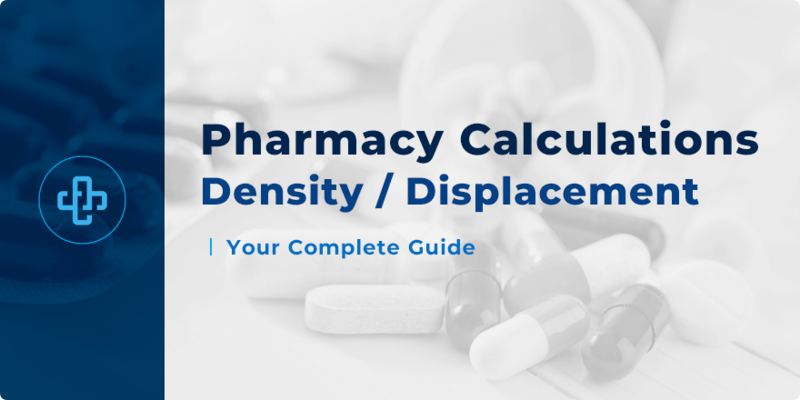 Density and Displacement Values | Pharmacy Questions Explained! Density is an essential characteristic of a substance, a measure that affects medicines too. Density is the name given to a relationship; a relationship between the mass of a substance and the space that that mass occupies. A substance with a high mass but low volume has a higher density that a substance with a low mass but which occupies a larger volume. As the principles of density and displacement apply to medicines, too, we need to consider how these principles impact pharmacy calculations. In this section we provide an overview of density and displacement values – reviewing seven key examples. While our account below is not intended to be exhaustive, it does introduce the pharmacy student to the fundamental principles of density and displacement values, why they are important and how we can navigate pharmaceutical calculations that include these concepts. At a certain temperature – for example – 20 degrees C – 100 grams of water occupies a volume of 100mL, a 1:1 relationship. This proportional relationship is, however, not the same for all liquids, solids and semi-solids. Given that different substances do not have this 1:1 ratio of mass:volume, it is necessary for the formulator to convert either mass or volume. A liquid may, for example, be easier to measure by volume rather than by mass. You are presented with two liquids: X and Y – specifically, 37.5mL of Liquid X and 18.2g of Liquid Y. Liquid X has a weight/mL of 0.65g and liquid Y has a weight/mL of 1.1g. Convert liquid X to its equivalent weight and convert Liquid Y to its equivalent volume in mL. First, we need to know the density of each liquid. The question provides us with those densities – liquid X has a weight/mL of 0.65g and liquid Y has a weight/mL of 1.1g. Keep in mind – the formula for density is mass/volume. From the table, we see that 37.5mL of liquid X has a weight of 24.4g and 18.2g of Liquid Y has a volume of 16.5g. Knowing the relationship between density, mass and volume is essential. It has practical value, too – allowing the formulator to measure low viscosity liquids by volume rather than by weighing the liquid. Calculate the final formula of 25g of the ointment. First, notice that units are different. Solids are measured in grams but the liquid is measured in mL. 1mL of liquid paraffin does not occupy a volume of 1g – meaning we need to find the density of liquid paraffin to make this conversion possible. The density of liquid paraffin is 0.88g/mL. 20mL of liquid paraffin occupies a volume of 17.6 grams. Notice that the difference between the values is 1/4 (100g/25g). Both x and y give us a combined weight of 8.15g. Given that we need a weight of yellow soft paraffin to 25g, we must subtract the weight of both liquid paraffin and zinc oxide to give us the final weight of yellow soft paraffin needed. 25g – 8.15g = 16.85g of yellow soft paraffin. Pharmacy students need to review the units used in each question – ensuring, where necessary, that they are consistent. Students should convert necessary weights and volumes. Pharmacy students should understand that not all liquids, solids, and semi-solids share a 1:1 proportional relationship for conversion. These are the foundational principles that must be followed when answering density and displacement questions. If 15mL of water is added to 85mL of water, the resulting solution is 100mL. In other words, there is no displacement. What if we add 10 grams of sodium chloride to 90mL of water? The total volume will not be 100mL; the volume will, instead, be much greater. The dissolved 10g of sodium chloride occupies a greater space than 10mL of water. In other words, sodium chloride acts to displace water, increasing the volume of the resulting solution. Substances such as sodium chloride have their own displacement volumes. Drug X has a displacement volume of 0.8mL/g – meaning that 1g of drug X displaces 0.8mL when dissolved in water. Displacement values are important when it comes to reconstituted powders. If a solution were 10mL more than the solution needed, it would dilute the concentration and consequently dilute the dose. For this reason, density and displacement values play an important role in pharmacy and pharmaceutical calculations. It’s against this backdrop that we review the next five examples. Drug X has a displacement volume of 0.07mL/5mg. Calculate the volume of WFI needed to produce 1mL of injection containing 5mg of drug X. Drug X has a displacement volume of 0.07mL/5mg – meaning that 5mg of drug X displaces 0.07mL in solution. We need to calculate the volume of WFI needed to produce 1mL of injection. Given that drug X displaces 0.07mL, it means that 0.93mL is required to produce 1mL of injection. In other words, the drug’s displacement of 0.07mL, plus the WFI of 0.93mL, gives us the volume of injection needed. What would happen if we didn’t use 0.93mL? If we added 1mL to 5mg of Drug X, without taking into consideration its displacement, the resulting solution would have a volume of 1.07mL. This reduces both drug concentration and drug dose – the precise opposite of what we hope to achieve. What volume of diluent is needed such that, when added to 80mg of drug X, it produces a concentration of 4mg/mL. The displacement volume of drug X is 0.5mL/40mg. If the required concentration is 4mg in 1mL, then 20mL is needed for 80mg of drug X. If 40mg displaces 0.5mL of solution, it means 80mg displaces 1mL. 20mL – 1mL = 19mL of diluent required. 68mL of water is needed to produce 100mL of a mixture containing 250mg of drug X in every 5mL dose. Calculate the displacement volume for a quantity of powder equivalent to the 250mg dose of drug X. If there is 250mg in each 5mL dose, 100mL has 20-times this – that is to say, 5,000mg. If 68mL is needed, it means 5,000mg displaces the remaining 32mL of water. Thus, 5,000mg displaces 32mL in 100mL; therefore, 250mg displaces 1.6mL in a 5mL dose. 1.6mL is displaced in a reconstituted 250mg/5mL dose. Prepare 2 sets of twelve 1 gram suppositories, Set A and Set B. Set A needs 12 suppositories – each containing 50mg of drug X whereas set B needs both 50mg of drug X and 300mg of drug Y in all 12 suppositories. Theobroma oil is used as the base for both suppository sets. What quantity of theobroma oil base is needed for each set? How much does an individual suppository weigh in each set? First, we need to convert values. Drug X and drug Y are in milligrams whereas displacement values are expressed in grams. Practical reasons necessitate that we need to consider excess when making suppositories – waste naturally develops during extemporaneous compounding. We assume production of 15 suppositories as opposed to 12 – meaning that, even in the presence of waste, we can be sure to produce 12 suppositories at the correct drug concentration. For set A, we need to know how much theobroma oil is displaced. (15 suppositories). (0.5g of drug X) = 0.75g of drug X needed. Next, we must divide 0.75g by its displacement value (0.7) to determine how much theobroma oil is displaced. This means that 0.75g of drug X displaces 1.1g of theobroma oil. Given that 15 suppositories are needed at 1g each, we subtract the displaced theobroma oil from 15g. 15g – 1.1g = 13.9g of theobroma oil needed for set A. We now run the same process for set B. 3g of drug Y + 1.1g from drug X = 4.1g of displaced theobroma oil from drug X and Y (for set B). 15g – 4.1g = 10.9g of theobroma oil needed for set B. This means that 13.9g of base is needed for set A and 10.9g is needed for set B (answering the first part of the question). We now need to determine how much a suppository weighs from each set. Why are there differences in weight? Because the displacement value for drug X is less than 1 for set A, whereas it’s greater than 1 for set B. Prepare twenty 2g glycogelatin pessaries, each containing 150mg of drug X. The displacement value for drug X is 1.6. How much does each pessary weigh? Ensure units are consistent: in this case, convert mg to grams. As a result, we will create twenty-five 2g glycogelatin pessaries – each containing 0.15g of drug X. This means that 3.75g of drug X displaces 2.34g of base. If we add this 57.19g to the 3.75g of drug X (calculated above), the total weight of the mixture becomes 60.94g. Given that we are creating 25 pessaries, it means each pessary must weigh 2.44g (60.94/25). Density and displacement calculations don’t need to be difficult. Pharmacy students routinely have difficulty getting to grips with the concept of displacement and why displacement values need to be used. However, once you have mastered the basic concept, the theory behind the calculations becomes that much simpler. You can then digest each question with ease – understanding what the question is asking and developing a logical, step-by-step approach to arrive at the correct answer. As with anything, it takes practice. Keep practicing though and the results will pay off.